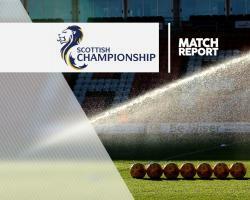 Raith Rovers gained a valuable three points in the race for Ladbrokes Championship survival with a 2-0 upset of promotion-chasing Morton. Morton's Ricki Lamie saw an early header clip a post but Raith responded and Craig Barr headed them in front in the 28th minute from Craig Johnston's corner. The woodwork denied Morton again as Kudus Oyenuga's shot was deflected onto the upright and again Rovers made the most of their good fortune, Ross Matthews turning in Jason Thomson's low cross. It was not to be Morton's day and substitute Jon Scullion curled a free-kick against the post as they were forced to wait to clinch their play-off spot.